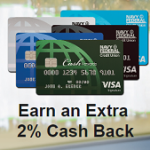 As part of a limited online pilot program, USAA is offering a credit card with an unlimited 2.5% cash back on all purchases. The USAA Limitless Visa, in addition to offering a generous cash back rebate on purchases, does not charge any annual fee or foreign transaction fees. Now, there are a number of caveats. First of all, you must be a USAA member to apply for the card. In addition, you must have a USAA Bank checking account with a qualifying direct deposit of at least $1,000 every month. If you do not have a qualifying direct deposit, you’ll earn 1.5% cash back on your purchases instead. And currently, USAA is only making the card available in the following states: AL, AZ, CO, GA, ID, IN, KS, LA, MI, NM, PA, SC, TN and WA. It will become available in additional states at a later date. Cash back award redemption is flexible — you can redeem any amount of cash back, provided it is done in increments of $1. Cash back can be redeemed as either a credit to your credit card account or you may deposit it into your USAA checking or savings account. To redeem your cash back, cardmembers must either access the USAA Rewards Service Center online at usaa.com or by phone at 800-980-8722. For more information or to apply for the card, see this link.